What a year! You know, when you're in it, I think you just don't see everything. I have been working REALLY HARD this year and doing A LOT of new things. Each day seemed hard. There was always so much to do, so many considerations, so many moving pieces, so many new things I had to learn/figure out, so much work, so much anxiety.... I'm sure you know what I mean. Then I look back and think "Holy Crap! I did ALL THAT?!" That's what this year was for me. I have traveled, lived, worked, taught all over the world since I was 18 but this is the first year I started teaching ART and FLOWERS around the world= living my dreams! I’ve comfortably moved into the word “artist” and have learned to breathe that in. I'm easing into the word “Coach” as I complete a Life Coaching certification and reflect on those women I have worked closely with in 2017 to help them find ease and beauty in their lives which in turn brought beauty to mine. I know my mission here this lifetime is to bring beauty into the world and help others find their paths of joy as well and I'm looking forward to all the ways this manifests in 2018 with Citrine Studios (my LLC). This year I traveled to Costa Rica, Morocco with my friends Mati Rose McDonough and Faith Evans Sills. I walked in Iceland for the first time dreaming up a new self care retreat which encompasses SLOWness and clarity. I led my very own Art & Flowers retreat in my old stomping ground in Paris (next year's dates posted. Are you coming with?). And I returned to my beloved London which was the perfect place for me to recenter and just be. 2018 is going to bring some more incredible amazing-ness back to these same locations AND will include some of my favorite artists coming to ME in Minneapolis at Citrine Studios for workshops/retreats! I’m also teaming up with some awesome creative women empowerment organizations who do good in the world (more details in the new year). Oh, did I mention I also started a NEW business in Minneapolis called Anahata Collaborative ?! Anahata refers to the heart chakra in Sanskrit. 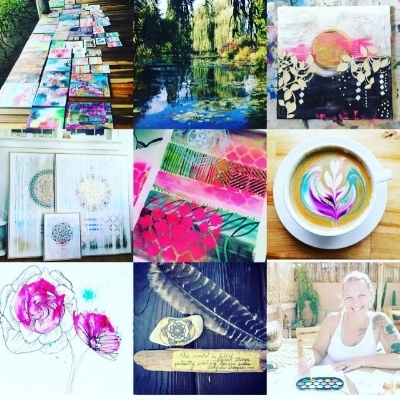 It's my own heart-centered business where I get to do what I love, but is also a place which supports and encourages others to live from their heart center in creative ways. In the new year we are launching something SUPER exciting called Anahata Academy. It's an in-studio & online Academy where you will spend one whole year with other heart-preneurs building your businesses, your creativity, your wellbeing and doing good. YES, it will be intense. YES, it will be amazing. Yes, you will see growth in FOUR areas of your life through the year! We are even planning an end of year celebration to congratulate you on ALL your accomplishments through the year! More info on Anahata Academy here. Yes, it’s been a wild year and I’M SO GRATEFUL!! Let's do great things together in 2018!